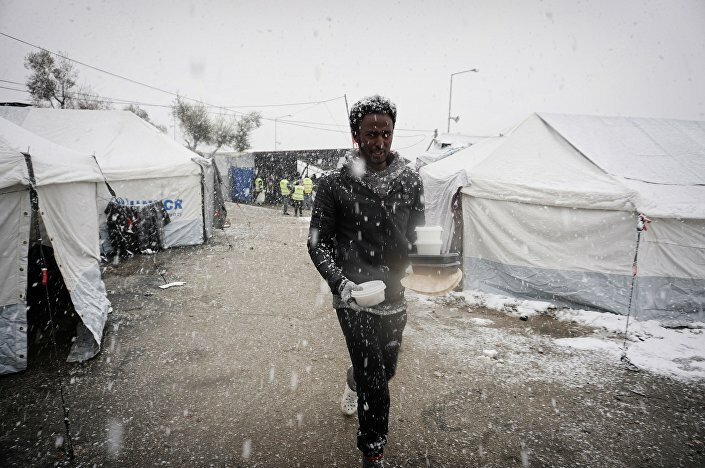 As freezing temperatures grip southern Europe, a team of Amnesty International researchers are on the ground on the Greek mainland and islands to assess how refugees and migrants are coping. ​"Refugees and migrants stranded on the islands or trapped on the mainland are woefully ill-equipped to deal with the bitter cold," Monica Costa, Amnesty International's Migration Researcher, told Sputnik. "This inhumane situation is the direct result of the EU and European government pressure to seal off the Balkan route without fulfilling their relocation commitments. In addition, it results from the EU-Turkey deal which strands asylum seekers on the Greek islands in order that they remain eligible to be sent back to Turkey." A third migrant was found dead in his tent on Monday, January 30, on Greece's Lesbos island, sparking an investigation into the conditions at the camps, ordered by Greek migration minister Yannis Mouzalas. 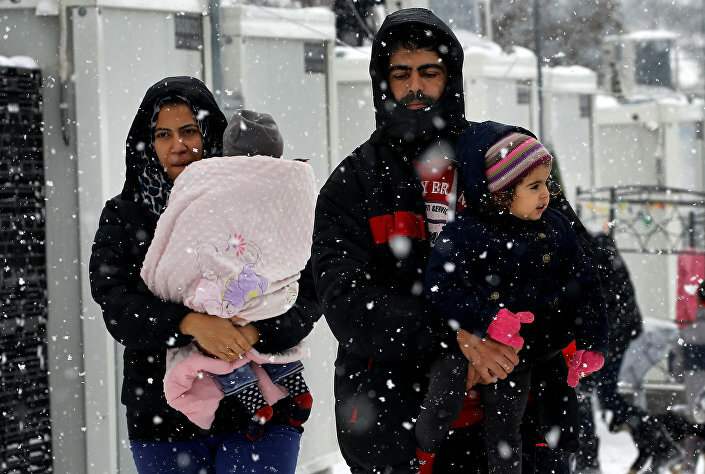 Stranded Syrian refugees carry their children through a snow storm at a refugee camp north of Athens, Greece January 10, 2017. Mouzalas ordered an investigation into the three deaths of refugees living in the Moria camp, Lesbos, telling reporters that he was "devastated," according to the Athens News Agency. "We have to investigate quickly the causes of the deaths in Moria and to proceed with action that will make the situation more manageable," he said, noting that the incidents are linked to overcrowding at the camp. The EU-Turkey migrant deal has attracted criticism over its policy of returning migrants refused asylum at centers in Greece to Turkey in return — on a one-for-one basis — for Syrian refugees in Turkey being relocated to EU member states. Many of the migrants are being held on the Greek islands pending return to Turkey, rather than being transferred to camps on the mainland, where conditions are — theoretically — better. A migrant walks after receiving food during snowfall at the Moria hotspot on the Greek island of Lesbos, on January 9, 2017. "Amnesty International has launched a petition to the President of the European Commission, Jean-Claude Juncker, asking him to urgently engage with European governments and change the policy of keeping people stranded in awful conditions on the Greek islands with the sole purpose of trying to implement the EU-Turkey deal," Iverna McGowan, Head of European Institutions Office and Advocacy Director told Sputnik, January 24. 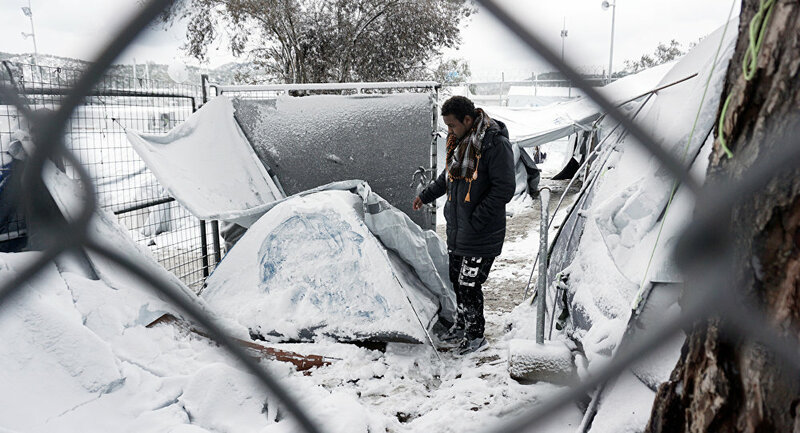 "Secondly, at this stage, so many months onwards with abnormally cold conditions on the Greek islands, the humanitarian imperative now has to take over and we would fully back any calls to move people urgently from the Greek islands to mainland Greece," she told Sputnik.